36% of Republicans feel their political views are reflected on television, compared to 57% of Democrats. 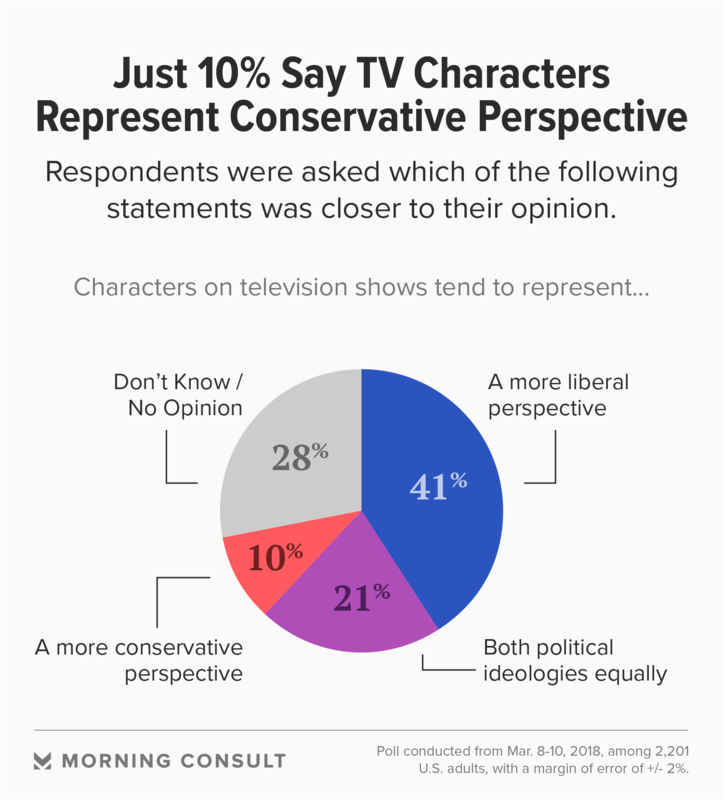 Respondents were four times as likely to say television shows tend to show a more liberal perspective (41%) than a conservative one (10%). Net majorities of Democrats (73%), all adults (65%) and Republicans (64%) say television shows should have more working-class characters. The family sitcom “Roseanne” comes back to primetime March 27 on ABC, with one important difference: Its namesake central character, played by actress and comedian Roseanne Barr, will be a supporter of President Donald Trump. The Conner family’s nine-episode revival could be welcome news to many Republicans who, per a new Morning Consult survey, feel unrepresented in pop culture. Media representation, experts say, is far from being reflective of the public overall — despite its crucial role in social education. “Being represented in the media is a form of power,” said Sherri Williams, an associate professor at American University’s School of Communication, in a March 15 interview. And “Roseanne,” which featured inclusive, groundbreaking story lines in its initial run, has the opportunity to offer a modern, messy portrait of American family life. 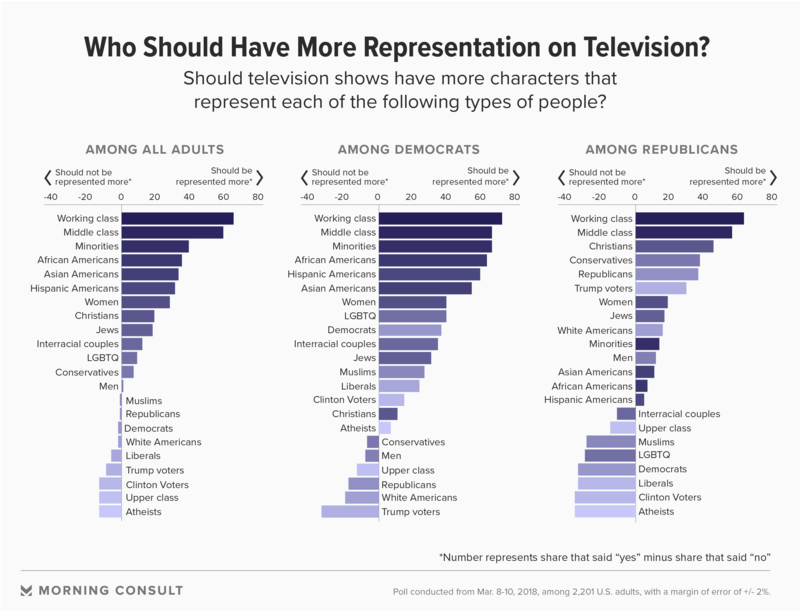 Just 36 percent of Republicans feel as though their political views are represented on television — a number that drops to 19 percent when considering broad representation in pop culture. That’s compared to 57 percent of Democrats who believe their politics are reflected on the small screen, according to a poll conducted March 8-10 among 2,201 U.S. adults. The survey has a margin of error of plus or minus 2 percentage points. “There’s a real sense that the dominant position in the country is anti-Trump,” said Jason Mittell, professor and chair of film and media culture at Middlebury College in Middlebury, Vt., in a March 19 interview — which could make Republicans feel underrepresented in popular culture. Per the survey, 59 percent of Republicans said they’re more likely to watch “Roseanne” knowing Barr’s character is a Trump supporter, while 54 percent of Democrats said they’re less likely to tune in. The public overall is divided. Even with conservative values displayed on the larger television landscape — vis-à-vis conservative cable news — there are few sympathetic television characters who are also overt Trump supporters, Mittell said. Republicans are not alone in feeling overlooked by the media. Whites, who make up 92 percent of the GOP, feel less represented than black and Hispanic adults. Less than one-third (32 percent) of whites say they feel represented in pop culture, compared to majorities of black (58 percent) and Hispanic (54 percent) adults. Yet the majority of television characters are white. Forty percent of regular characters on 2017-18 broadcast scripted primetime programming were people of color, according to GLAAD’s annual report on representation. Amanda Lotz, a professor of media studies at the University of Michigan, suggested that whites have been the culturally dominant group for so long that their requirements for representation are more exhaustive. Whites might feel unrepresented if they don’t see characters of their specific class, gender or religion, she said in a March 16 email. The increase of minorities appearing on the small screen — a number that’s doubled in the last five years — could be propelling many black and Hispanic adults to feel as though they’re represented on TV, experts noted. “Roseanne,” in its heyday, did represent one largely overlooked group: working-class Americans. Seventy-three percent of adults in the recent Morning Consult survey said television shows should have more working-class characters, while 8 percent disagreed — a net of 65 percent. A net 73 percent of Democrats and 64 percent of Republicans agreed. Such representation of the working class is important, said Lotz, as these Americans never saw their lives in the media and never heard their stories offered back to them. The decision for the 2018 “Roseanne” to directly address political party politics makes sense in this tribal, political environment, she noted. Although Barr’s character will support Trump, Executive Producer Bruce Helford said during a Television Critics Association Winter Press Tour in January that the Conner extended family will represent a “full cross-section of ideas and beliefs,” the Associated Press reported Jan. 9. That includes featuring a 9-year-old boy who dresses in traditionally feminine clothing but does not identify as gay or transgender, executive producer and “Roseanne” actress Sara Gilbert told Entertainment Weekly for a story published Jan. 5. This could upset some Republican viewers: A net 30 percent said they do not think LGBTQ characters should have more representation in television shows, compared to a net 40 percent of Democrats who said they should. ABC declined to comment for this story. Notably, Roseanne’s 1988-97 run featured several recurring gay characters, a decision that was considered radical for the time. “In the 1990s, Roseanne was a progressive, enlightened working-class advocate for feminism and LGBT rights, workers rights and equality,” Williams said. A 1994 episode titled “White Men Can’t Kiss,” for example, directly addressed racism, while a 1992 episode shows Roseanne fighting for fair wages and labor rights with a local state representative. In that same episode, Roseanne criticizes the representative’s decision to cut the corporate tax rate, a key component in Trump’s tax reform law. Such nuance could allow “Roseanne” to provide a more complicated view of American politics and family life, experts noted, though they suggested pop culture and television still need better and more accurate representation of racial and ethnic minority groups, women, members of the LGBTQ community and disabled adults. “Representation is how we learn about the world that we don’t experience — which is most of the world,” Lotz said. Roseanne discusses corporate tax cuts with a state representative on "Roseanne"
Correction: A previous version of this story misstated the number of episodes in the “Roseanne” revival.